Read these books for insight into America’s opioid crisis. As the opioid epidemic expands each year, the number of books about America’s overdose crisis also continues to rapidly grow. Several new titles covering all angles and perspectives of the epidemic and its history have been released, offering new research and insight into the complex issues involved. In addition to these nonfiction books, there are several new works of fiction that approach the struggle of addiction with compassion, care, and nuance. Each one contributes to a deeper understanding of where we are at and where we need to be going. Ryan Hampton is a former White House staffer and opioid addict who is now a national recovery advocate with ten years clean. 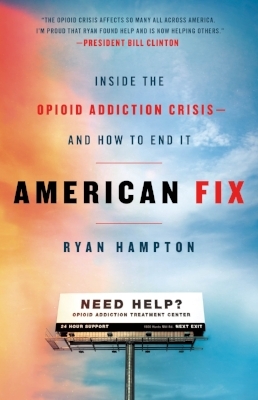 With American Fix, he gives an inside account of the opioid crisis from firsthand knowledge through his own personal journey in addition to calling for new, long-term, evidence-based models of treatment that have shown to be more effective than the traditional 28-day model. Overall, the message is uplifting, giving hope of new directions and possibilities for treatment. Immediate New York Times bestseller and released to high praise, Journalist Beth Macy focuses on central Appalachia as the heart of crisis and widens the scope from there to show how individuals and communities are affected. Through talking to opioid users, family members, dealers, doctors, judges, activists, emergency responders, and law enforcement, we get a much larger picture of the causes and effects. Harris Wittels didn’t fit the stereotype of what a junkie looks like. He was a successful comedian, actor, producer, and writer for Sarah Silverman and on shows like Parks and Recreation and Master of None. Even with all his talent and jobs coming his way, he was not able to get clean and stay clean, eventually dying from an overdose in 2015 at age 29. Everything is Horrible and Wonderful is written by Harris’s sister, Stephanie, about his tragic death and the aftermath of losing her younger brother who was her best friend and also an addict. Extremely timely as more and more children are being raised by grandparents due to their parent’s addiction. Krosoczka is a well-known children’s illustrator and author who didn’t realize till later in life that his mother is an addict. Growing up, he was raised by his grandparents after she can no longer care for his basic needs due to being in and out of rehab and his father is out of the picture. This graphic memoir is an honest and accurate portrayal told from the child’s point of view of what it’s like growing up with a suffering parent who still loves and cares and is trying their best but are wrestling with a terrible addiction. Debut novel from Nico Walker who wrote it while incarcerated for bank robbery. The fictional book is based on Walker’s life, telling the story of an unnamed narrator who drops out of college, joins the army, returns home to Cleveland, and becomes addicted to heroin as a result of his being lost and directionless. The honest and accurate portrayal of addiction and withdrawal has led to it being called the “first great novel of the opioid epidemic”. Similar to Cherry, Ohio is also a devastating depiction of the aftermath of returning from war and getting swept up by the opioid epidemic and is set in Ohio. This novel is about four former high school classmates who return to a small fictional town in southeast Ohio, called New Canaan, one night in 2013. Each one has experienced hard times during their 20s and now wants to make things right. The book reads more like a set of four portraits of characters coming together in a town that has been ravaged by the recession, addiction, suicide, and hopelessness, all with their own forms of escape and return. Workit Health offers medication & online therapy for addiction. Andrea Perez is a librarian and Workit Health social work intern currently working towards her Master’s in Social Work. She is passionate about both reading and addiction recovery.